Nose: Rich fruit and spices. Palate: Well-rounded, full, and generous, with glossy tannins and a complete absence of any roughness. I have often joked that this is the best French wine made in Italy. Since 1981 Ornellaia has produced some of the greatest wines in the world, and the Ornellaia Bolgheri from 2012 is a fine example of their illustrious history. Expensive? Yes, but not when compared to Latour or Margaux at three times the price. The 2012 growing season was characterised by an abundance of sunny, dry weather; some rain did fall as well, but it occurred in just the right periods, before the harvest, and helped the vines to cope with the hot, dry conditions. The result was an even, consistent ripening process that in the end yielded generous, full-volumed wines that are remarkably appealing and seductive, with an overall character that we like to define with the word Incanto (Enchantment'). 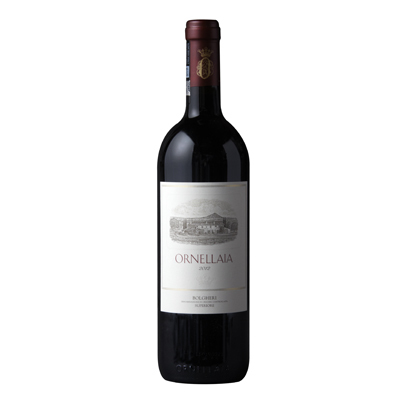 Ornellaia 2012 appears a deep ruby, and a remarkably beguiling bouquet boasts rich fruit and spices notes. The palate of this Bordeaux red wine shows well-rounded, full, and generous, with glossy tannins and a complete absence of any roughness. The Ornellaia 2012 lacks none of the proverbial concentration that distinguishes Ornellaia's, great vintages, but this vintage adroitly masks that richness behind an expansive, magisterial structure, then concludes with a near-endless finish.